"Known unto God" - help us put a name on a headstone ! On 23 April 1940 Pilot Officer Hector Garmen Webb was killed when his Hudson was shot down by the HMS Curacoa in a tragic friendly fire incident near Åndalsnes. 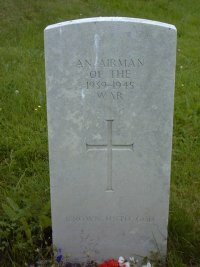 An airman "known unto God" is buried at Åndalsnes Cemetery. No other RAF staff was lost in this area, no other airmen are buried here. In spite of this one-to-one match, proving that Webb is resting in the unnamed grave has been surprisingly difficult. We need your help. We would like to see a name on this headstone. Any information even remotely related to the flight of the three Hudsons may be helpful. Almost 20 years after I started investigating British war graves in Romsdal, and 15 years after Tor Christian and I created this page, Pilot Officer Hector Garman Webb finally got a proper headstone with his name engraved. I have tried to reconnect and thank each and everyone who has helped us in our research through the years. Some have passed away during this time and there are one or two people I have not been able to find at all. If that is you, reading this, please contact me. I shall be most happy to share the full story, newspaper clippings etc with you. In my research I have been in contact both with the Commonwealth War Graves Commission and its German counterpart Volksbund Deutsche Kriegsgräberfürsorge. In Germany they say Ordnung muss sein, order must prevail. The War Graves Commission taught us why Britain coined the phrase red tape. I plan to include the full story of Webb's case, as well as four upcoming identification cases on a web site called 'War Graves in Romsdal'. PLEASE NOTE: The information below has not been updated since 2004. On Monday 6 September 2004 construction work near the crash-site of the Hudson uncovered this Browning machine gun. 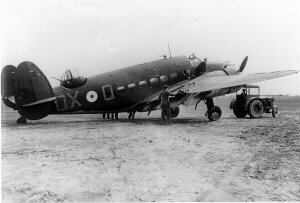 In April 1940 the 224 Sqdn RAF Costal Command was based at Leuchars, Fife. The three aircraft in the mission to Romsdal were possibly a detachment based at Wick, Caithness. It has been suggested that Hector Garmen Webb may have been an American volunteer. How can we learn more? We only know (from the London Gazzette) that Flight Sergeant Webb was commissioned as Pilot Officer on 1 APR 1940. Emergency landing at Wick. See picture below. Crashed on the northern shore of the Romsdalsfjord on a croft called Toklegjerdet, about 2 miles NE of Åndalsnes. P/O Hector Garmen Webb, pilot, killed in the crash, record at CWGC. This plane also made it back to Wick. 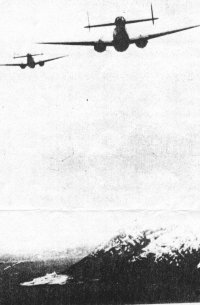  Both registration numbers have been quoted with reference to Ross McNeill's "RAF Coastal Command Losses Volume I: Aircraft and Crew Losses 1939-1941". Hudsons over Romsdalsfjorden. Åndalsnes is the white area in the lower left corner. The HMS Curacoa must have opened fire minutes, if not seconds, after this photo was taken. This picture was printed in an article by Hugh O'Neill in "Aeroplane Monthly", August 1985. Against all odds this Hudson (N7264) made it back to Wick. The escape hatch was released when the plane passed the hedge. 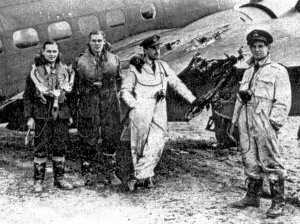 The crew is (left to right): AC Court, LAC McGhie, Pilot Officer Talbot Rothwell og Pilot Officer Hugh O'Neill. P/O Rothwell was later known as the writer of the twenty or so "Carry On" films.